A week or two ago I went fishing at Rose Canyon Lake on Mt Lemmon. It is a fishing spot about 1 hour and 45 minutes from my house and sadly the closest spot near me. It is no one's secret hole and is usually crowded, but that day it was somewhat deserted. I brought some rods for my fishing company and various lures and plastics for them to use. I myself was planning on trying out some new spinners I had made. I had a spinning combo and my new Kurenai HM63R. 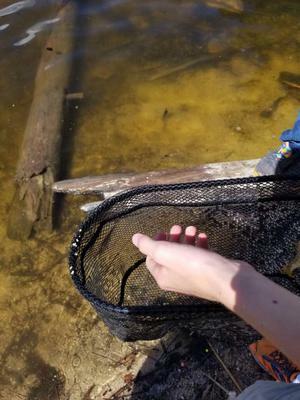 The lake has stocked trout as well as some small wild trout in it. They eagerly took to slashing at a minimal dace variant I tied to more closely mimic the lake's bluntnose minnows. They didn't want to actually eat it so it was spinners or bust. 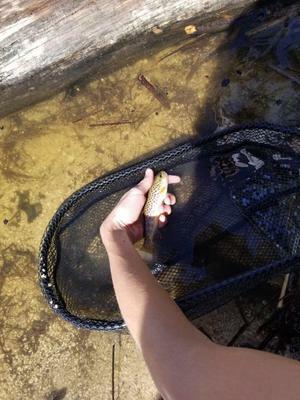 After nearly a half hour of no bites, an aggressive little brown was hooked and brought to the net. It didn't want to stay still at all for the photo (see above photos). Chris, I now understand your struggle with trout photography. All in all it was a fun day with friends and experimenting. Though I still have not caught my Kurenai fish, it will happen. The spinners worked well and I wasn't skunked. By Arizona standards, that was a great day. Really nice spinners! I used to bend my own a few years back. Did you do them by hand or use a tool? Glad you had a productive day on the water! I did use some round tipped pliers for bending the eye loops. I also used some locking pliers to hold the wire while I bent the tag end of the wire around the shank with my hands. 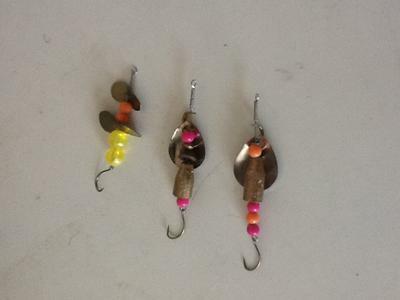 The beads are from a large box of craft beads and the other pieces are from larger trout spinners I bought years back. These work better though and they don't weigh as much so I like 'em. I've made some new ones to test so I'm gonna need to write about those sometime soon. Thanks for reading. Mike, thanks for reading. I used some various pliers to bend the eyelets and hold the wire shanks. Rest was just bending this way and that with my fingers. I made some more that I will have to report on, but I might do that one for the finesse fishing site. Hope to see you there.